Broken, messy, hollowed — to name a few. There Noland and I were, standing before our leaders, updating them on where we were at in the grief process and letting them know how they can pray as we get ready to move across America and plant a church. We were moving all the boxed up pieces of our life across the country and all at the same time I felt like I was going to have to box up all the broken pieces of my self in hopes that somehow my whole being would make it. As we finished sharing I told them I honestly didn’t understand what God was doing or how He would redeem this season of our life. That I felt broken and messy and I wanted to feel bold and courageous and fearless when I planted a church, but instead all I really felt was just how much I desperately needed Jesus every step of the way. And something felt right about that. Fast forward five months, and it isn’t exactly a glamorous adventure out here. Sure, my Instagram feed is laced with snow capped mountains and gorgeous sunsets and lovely coffee shops. But my journal is full of pleas for breakthrough and healing and justice. Last week was a sobering week of ministry. We’ve turned a corner beyond the “getting to know you” phase of building community here, and we’re starting to really get into peoples lives, (Praise God! This is what we came for!) and peoples lives are messy. I’ve counseled girls through broken marriages and families. I’ve contended for breakthrough with them in relationships, walked with them through break ups, wrestled and cried with them through infertility and hope deferred, and wept with them over the unexpected death of a parent. I’ve watched our city be in turmoil over the recent announcement of a policy that ostracizes children from a certain religious organization, breaking hearts and raising questions in the minds of dear friends of mine, who are confused about what’s true of God’s heart for His children. Honestly by the time I got to Friday last week, I was feeling a little bit discouraged. I was certainly feeling pastorally unprepared for some of the hard conversations I’d had that week. I felt like I was fighting some losing fights. And then Sunday, something shifted. My job on Sundays is to produce our service. If there’s a problem, I fix it. If there’s a wrinkle, I smooth it. If there’s a technology glitch I do everything I can and then I just pray until someone who’s smarter than me figures it out. I tend to be so deep in making sure things go smoothly that I don’t always get to really engage in worship. But this Sunday, I had this really sweet moment with God. 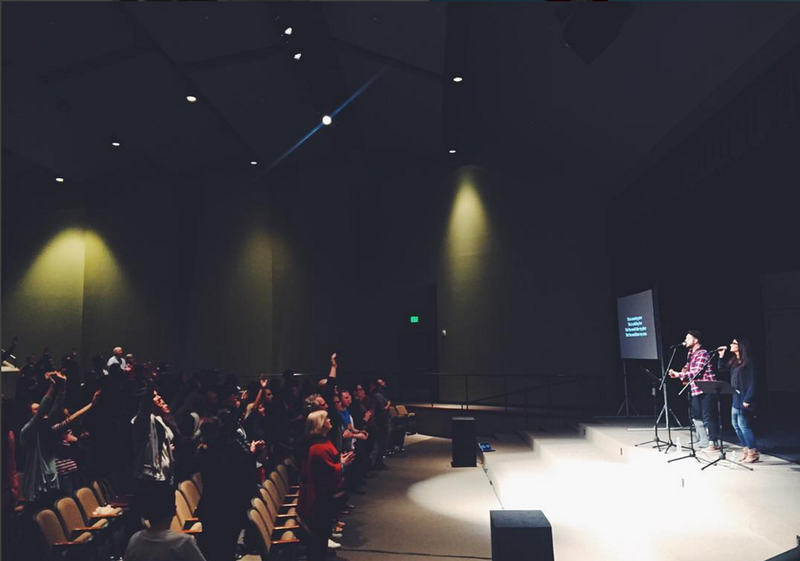 I was standing off to the side, trying to get a good photo of worship for our Instagram. I scanned the crowd and one by one I watched all those broken people I’d been walking with raise their hands in desperation for Jesus. I wiped tears from my face as I remembered all over again that this is why we came here. Because we live in a world full of broken people in desperate need of a Savior. I know that deeply because I still wake up every day undeniably aware of how broken I am and how much I need Jesus. I looked around and I snapped a few photos of our people worshiping Him, crying out for healing — singing along with my sweet, heroic husband who knows deeply what it is to need and cry out for and be met by the grace and mercy of Jesus. People showing up, messes and all, and crying out for Jesus. What I’m realizing in this season is that the world wants us to look at pain and disappointment and loss and injustice as defeat. But friends, we live in the kingdom of Heaven, where up is down and first is last. For this reason we jokingly (but seriously) refer to our city as “Salt Lake City on a Hill” — although it sits deep in the middle of a desert valley. So when I’m looking at our city and our people, and I see pain, loss and injustice — I’m not cowering back in defeat. In the Kingdom of Heaven, this is a recipe for revival. And I’m standing firm on the promise that everything He says is true. Salt Lake City is pregnant with revival — and she’s carrying multiples. The pain is part of the process, but in the end: LIFE. And life abundant. ← Empty Handed. Not Forsaken. I love this! I’ve always had a heart for Salt Lake City. I’ve never been there nor do I know anyone there, but I’ve always wanted to see Lord spark revival there. So glad to see you serving there and to hear the inside story. Praying the Lord brings you nearer. Praying he saves again and again. So awesome! It’s always encouraging to hear when people have a heart for our city. Get out here for a visit!